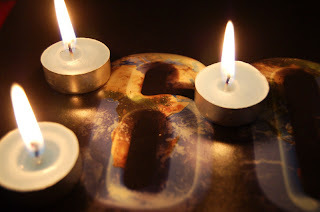 Earth Hour will soon be upon us. It's this Saturday March 27 at 8:30 local time. Are you planning to participate? Now, I know there are detractors. Those who think that this is an empty gesture which doesn't change peoples' actual energy consumption throughout the rest of the year. Anything that gets people talking (good or bad) about energy consumption and climate change is ok by me. Earth Hour falls close to my birthday. Every year when my family and friends ask me what I want for my day, I ask them to turn their lights off on my behalf. And guess what happens? Some people who don't care about their energy consumption the rest of the year actually turn their lights off and enjoy an hour of their evening by candlelight. My in-laws, my Dad, my IRL friends, my online friends. Yes, some turn their tvs and lights back on immediately at the end of the hour, but others don't. And more than that, we usually end up talking about energy consumption at some point during the week. Earth Hour is not intended to reverse our carbon footprint or solve climate change or reduce the world's energy consumption. It is a gesture. In the same way that running 5k is a gesture toward finding a cure for breast cancer. It is just a reminder that we need to be conscious. And let's face it, every thing helps. Every reminder. Every gesture. Every little action. Like the idea behind One Million Acts of Green: if everyone does something small, the impact will be large. So, this year I'll be having my birthday party by candlelight. Which is funny, because I don't usually celebrate my birthday. But a bunch of people are coming... with candles. And those who can't come? Most of them have pledged to turn off their lights wherever they will be, on my behalf. It's not much, but Earth Hour will be more than it was without us. And that's a start. What are you planning for Earth Hour 2010? Leave a comment!